Rally minions and collect taxes in Kingdom as you raise your empire from the ground. 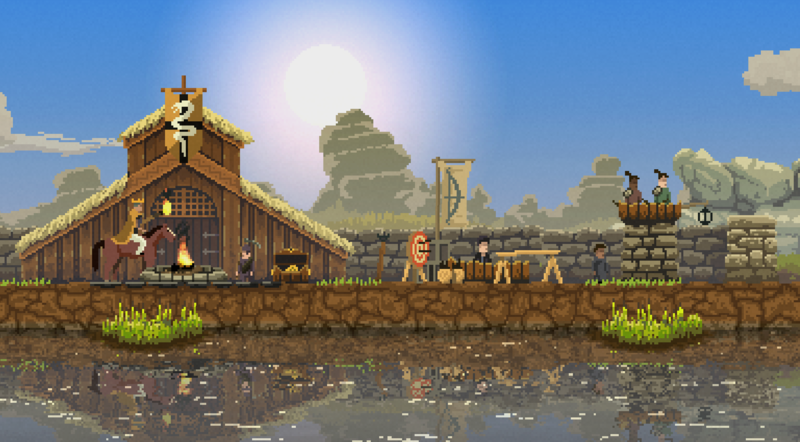 Kingdom, a self described pixel art minimalist strategy game, prompts you to recruit peasants, build a place for them to live, and then defend it against oncoming waves of monsters known simply as "the greed." Your story begins in the countryside, where your would-be monarch is prompted to build a small campfire by literally throwing money at it. As you expand and populate your encampment it grows in strength. Blacksmiths will setup shop and craft bows for you, which other minions will in turn pick up and carry into the woods to shoot wild game. But in the end, they're all really just earning you money. Every morning, your constituents turn out their pockets as you gallop past them on your trusty steed to collect their daily tithes. Every night, the greed will come to pillage your town and rob your citizens. Sometime in between, you'll find time to reinforce your defenses and spread out further into the world. 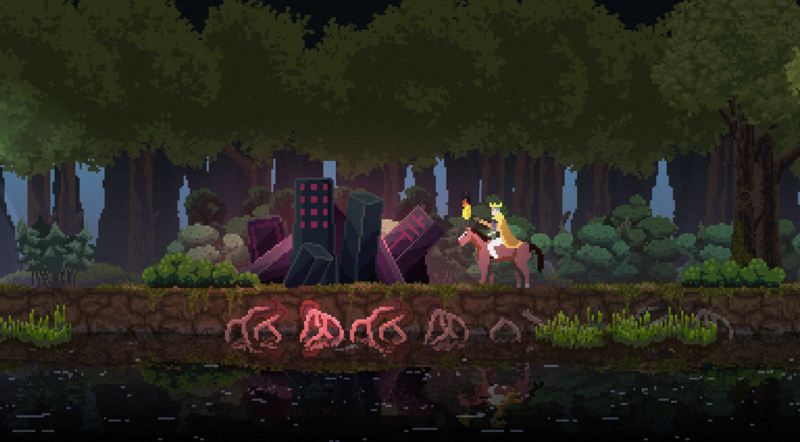 Visually, Kingdom is very retro, inspired by the simplistic style of games like Sword and Sworcery EP. Kingdom's basic design doesn't make it shallow, though. Instead, it manages to surprise you with hidden gems of refinement, while still continuing to strike all the right nostalgia chords. For example, as you move into the forest you'll notice the light dimming just a little, filtered out by the shading of the trees. If you walk along the lakeside, you'll notice yourself and your horse reflected in the placid pool below. In this way, Kingdom is both complex and basic at once. The most striking thing about Kingdom is it subtlety. There is only one resource, gold. Furthermore, gold is also the only visible metric of the user interface, represented by a simple coin bag in the top left corner of the screen. Likewise, there is only one mechanic, and that is to spend money on things. Otherwise, there are no bars, buttons, or visual prompts. Instead users must learn to think a little outside the box, discovering for themselves the various clues and hints that suggest what is occurring. For example, to determine what time of day it is, you learn to look for where the sun hangs in the sky. Similarly, destroying a stone emblazoned with the freemason symbol will imbue you with the knowledge of masonry. In this manner, users aren't infantilized, but are instead invited to pay attention and problem solve. 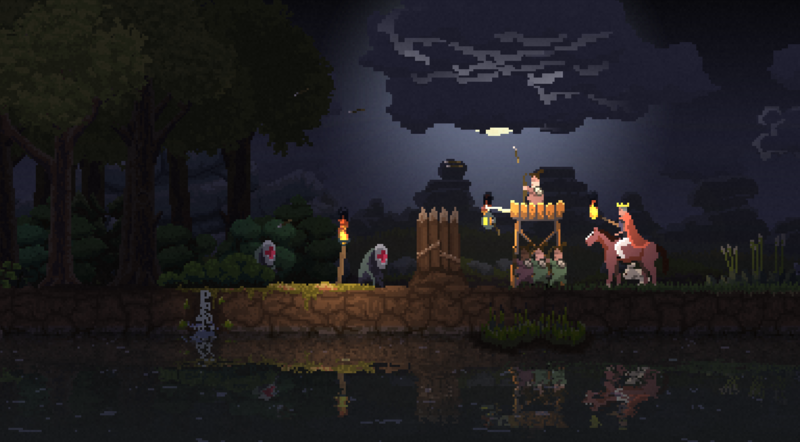 Kingdom has been in development for two years, which is pretty average for an indie game. However, it's quite impressive that the developers of Kingdom have paid so much attention to its details, especially considering that it's being made by a very lean two-man studio split between the Netherlands and Iceland, Noio and Licorice. 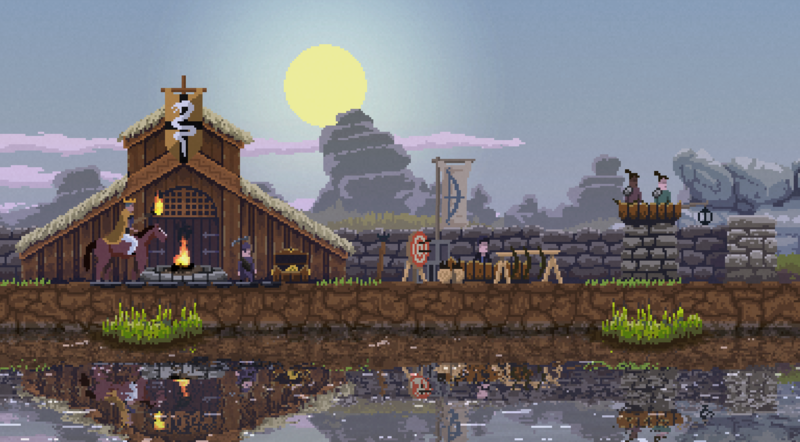 The creators of the Unity-made Kingdom hope to release it sometime next year on PC and Apple iOS, however no specific launch date has been set yet.